The BBC has seen a letter written by the Cabinet Secretary for the Rural Economy and Connectivity, Fergus Ewing MSP, that says he “wholly disagrees” with the Crofting Commission’s stance on Common Grazings Committees and the distribution of funds received by them. 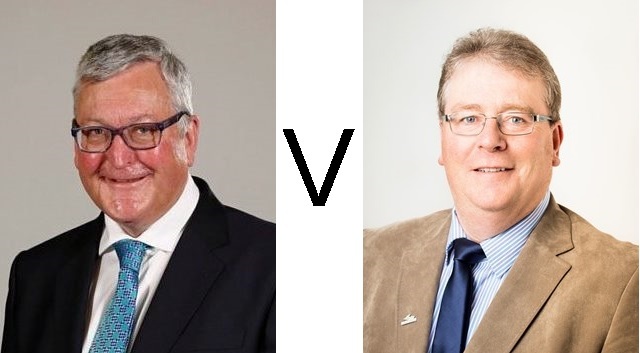 The Scottish Government is going head to head with the Convener of the public body responsible for crofting. In a hard hitting letter seen by BBC Scotland the rural affairs secretary, Fergus Ewing, has told the Convener of the Crofting Commission that he wholly disagrees with his handling of a bitter dispute over shared land in the Western Isles. BBC Scotland reporter Jackie O’Brien has seen the correspondence and Gary Robertson asked her what the background was. Well this has been a protracted and slightly complicated dispute involving the way that the ground crofters share is managed through what they call common grazings committees which are made up of crofters. Now earlier this year two committees on Lewis, one in Mangersta and the other in Upper Coll, were removed from office by the Crofting Commission. This happened after questions were asked over financial records and some transactions including the fact that the Upper Coll committee had not distributed or as they call it disbursed income from croft house sites to individual crofters but had put all of the money into a crofting township fund instead. Now the Commisssion in the meantime appointed what they called constables to manage the land whilst committee accounts were investigated. One of the committees has been reinstated but there is still annoyance and outrage over the way that this whole affair has been handled. Some say it is belligerent and unlawful and there have been calls for the resignation of the Crofting Commission Convener, Colin Kennedy. So what exactly does Fergus Ewing say in this letter? Well the rural affairs secretary has been trying to calm the waters and has been quite diplomatic on this to date. But there is no sign of it in this letter which I have seen that he has sent to Colin Kennedy. He confirms that contrary to Mr Kennedy’s views the Crofters (Scotland) Act does not require the immediate disbursement or pay out of funds by a grazings committee. He says that as it currently stand the Scottish Government sees little merit in the Crofting Chairman’s views which he says he wholly disagrees with. The letter goes on to say that the Government’s view is diametrically opposed to Mr Kennedy’s and that it is not sustainable for the Scottish Government and one of its public bodies to take opposing interpretations of the law. Any response from Colin Kennedy himself? I did speak to him last night. He is adamant that he has done nothing wrong. He claims that all of the decisions which have been made have been made during/since he has been Convener have been based on papers supplied by the Commission’s executive. He has also insisted that not a single matter on this has ever had to go to a vote or at board level and he says that all decisions are taken by means of reasoned debate and consensus. What is your sense of the implications of this clash? Well the contents of this letter shows the Government is clearly pointing the finger at Mr Kennedy who is an elected Convener. This is backed up by the fact that Fergus Ewing has said in his letter that he is also very concerned about the risk that policy decisions may be taken without a clear mandate from the Crofting Commission’s board. This implies that not everyone on the board supports the way things have been handled. Now the Commission’s board does happen to be meeting today, and in his letter Fergus Ewing has asked for its position on the matter to be made clear after this meeting. But he warns that if the Commission continues to subscribe to an entirely different view he will then have to consider what action to take. It is not clear what that action could be but that could put further pressure on him to resign. The Scottish Government clearly takes the same view regarding the law on the common grazings debacle taken from the outset on the Crofting Law Blog. It is good that they have done so and made their position clear in such strong terms. The law on the matter has in my view been fairly clear. It is also, it transpires, clear to the Scottish Government. Why has it been so unclear to the Crofting Commission? Despite repeated requests from me to the Crofting Commission asking them to justify their position with reference to statute and case law they have failed to do so. They have simply ignored me. If they had papers from their executive that backed up their position in law surely they would have referenced those to me. The Chief Executive of the Crofting Commission, Catriona Maclean, suggested in a meeting of the Scottish Government Crofting Stakeholder Forum that the law on the matter would follow “in due course” after the Commission had drawn up new guidelines for grazings committees to follow. Putting the cart before the horse was never a good idea! The Convener of the Crofting Commission, Colin Kennedy, has said to BBC Scotland that the Commission were following advice given in papers produced by their executive. Oh no they weren’t! The Crofting Commission specifically ignored the advice given by the executive and appointed grazings constables in circumstances where they knew that to do so was illegal. How many other times has this happened? There is a degree of irony in that the Commission may be requiring grazing committees to adhere to regulations while not being clear about the procedure it is itself employing in directing this. Thus did the Commission actually have papers from the executive to consider when making some of their decisions or were they simply making it up as they went along? We also, of course, know that the Commission has chopped and changed its position on the matter, tried to hide the fact they have done so and ultimately made a massive U-Turn. Does that demonstrate having done nothing wrong? In light of the stance now taken by the Scottish Government against the Convener surely his tenure in office must be in question more so than it ever was. Especially if he continues with the adamant view that he has done nothing wrong when all of the evidence that has so far come to light would perhaps suggest otherwise. The Crofting Commission are having a board meeting today. On the agenda [PDF] is ‘Grazings committees – a practical approach to the management of common grazings’ with a paper on that topic for discussion. A practical approach would no doubt be a welcome approach from most crofters. But let’s hope the Commission have now got a clear understanding and grasp of what the law actually is when applying a practical approach. A little bit of humbleness, signs of regret and an apology would not go amiss at today’s meeting in light of the letter from Fergus Ewing. A statement from the Crofting Commission on the outcome of today’s meeting is awaited with bated breath. This entry was posted in Common Grazings, Crofting Commission and tagged BBC, BBC Radio Scotland, BBC Scotland, Cabinet Secretary for the Rural Economy and Connectivity, Colin Kennedy, Common Grazings, Common Grazings Committee, common grazings debacle, Common Grazings Funds, Convener of Crofting Commission, crofters, Crofters (Scotland) Act 1993, Crofting Commission, Crofting Commission Executive, crofting township, crofting township fund, Fergus Ewing, Fergus Ewing MSP, Gary Robertson, Grazings Constable, Grazings Constables, immediately, Isle of Lewis, Jackie O'Brien, Lewis, Mangersta, Mangersta Common Grazings, Mangersta Common Grazings Committee, practical approach, resign, resignation, Scottish Government, Upper Coll, Upper Coll Common Grazings, Upper Coll Common Grazings Committee, Western Isles on August 17, 2016 by Brian Inkster.